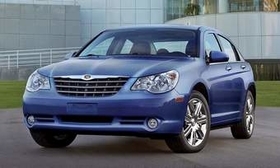 The Chrysler Sebring is expected to get an extensive face-lift in 2011. With Fiat-based replacements still at least two years away, the Chrysler Group has delayed plans to kill its slow-selling Chrysler Sebring and Dodge Avenger, sources say. The two sedans were all but left for dead by previous owner Cerberus Capital Management. Now insiders say Chrysler intends to freshen the cars and keep them on the market until late 2012. Under Cerberus Capital Management, Chrysler had planned to close, at the end of 2010, the factory in Sterling Heights, Michigan, where the cars are built. Sources say the shutdown could be delayed by up to two years, but the sedans could be shifted to another Chrysler plant. Chrysler's board met Friday, Sept. 25, to approve a five-year product plan, but the company won't disclose details until November. Under Cerberus, Chrysler had not planned a midcycle face-lift of the Avenger or Sebring. Now the Sebring is expected to get an extensive face-lift in 2011. A revamped Avenger could arrive even sooner because it is expected to undergo fewer changes. The Sebring, which was introduced in 2006, and the Avenger, which arrived in 2007, have failed to take off in the market. Through August, Sebring and Avenger U.S. sales totaled 40,452--compared with 238,612 for the Toyota Camry, the mid-sized segment leader in North America. Cerberus had planned to replace them with all-new models. But a team formed in early 2008 to evaluate the mid-sized segment was disbanded after a year. CEO Sergio Marchionne has acknowledged that Chrysler's product cupboard was essentially bare when Fiat S.p.A. management took control June 10 after Chrysler left U.S. Bankruptcy Court. "We were surprised by how little had been done in the past 24 months," Marchionne said at the Frankfurt auto show. "It will be a slow progress in the beginning." According to a company document, Chrysler also plans a midcycle face-lift for the Chrysler Town & Country minivan at the end of 2010 and a new interior for the Dodge Journey crossover a year later. The Detroit Free Press reported last week that Marchionne wants to face-lift several other models by mid-2011. Those include the Dodge Grand Caravan minivan and Caliber small car, the Jeep Compass and Patriot crossovers and the Chrysler PT Cruiser. John Wolkonwicz, an analyst for IHS Global Insight, says Chrysler badly needs fresh product to generate cash flow. Global Insight's forecasts don't call for Fiat-based products to arrive in the Chrysler lineup until 2012 or 2013. "Meantime they've got to stay afloat and make some minivans, LX cars and Jeeps," said Wolkonwicz. "Those are the profit generators the company has today, and whether they admit it or not, they'll be the profit generators of the future." Before the Fiat-based vehicles arrive, Chrysler has four major product launches in the works. The Jeep Grand Cherokee, first shown at the New York auto show this year, is scheduled to arrive in mid-2010 as a 2011 model. A Dodge Durango, built on the same platform as the Grand Cherokee, is scheduled to arrive in 2011 as a 2012 model, according to a Global Insight forecast. The Dodge Charger and Chrysler 300 also are also due for a redesign. A new version of the Charger will appear in 2010, and a redesigned 300 will follow in 2011.